Koninklijke Marine. Via Wikipedia Commons. Dimensions 321'10" by 31'6" by 9'8"
The Van Galens were near-sisters of the Van Ghents (the two classes sometimes being listed together as the Admiralen class) but were built in 1927-31 without British assistance. They were completed with higher-pressure boilers. a more effective antiaircraft battery featuring the 40mm Bofors, and minesweeping rather than minelaying gear. 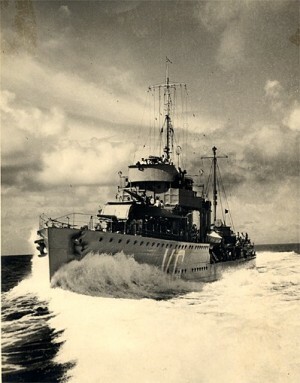 Though obsolescent by the start of the Pacific War, the Admiralens formed the main Dutch destroyer strength in the Netherlands East Indies. All were lost during the war, although the Banckert was partially salvaged by the Japanese and returned to the Dutch after the surrender.